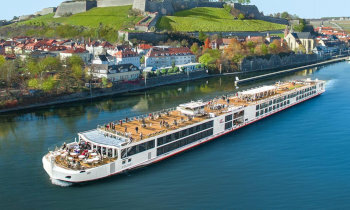 View all Viking Magni cruises by clicking the ‘Cruises’ tab above, view our handpicked selection of Viking river cruise deals, or view more options for Viking River Cruises. Need help? Call our river cruise experts on 13 13 03 or contact us. Son of the mighty Norse god Thor, Magni is believed to be the one god stronger than his father. He is so strong that he is the only one besides Thor to be able to lift Mjollnir, Thor’s mighty hammer. Designed by legendary naval architects Yran & Storbraaten, the team behind The Yachts of Seabourn, the Viking Magni offers state-of-the-art engineering, patent pending design* and luxury. The Viking Longships provide guests with more ways to personalize their trip. Choose from a variety of stateroom classes, onboard entertainment options and ship locations from which you can enjoy sailing through the scenery, all the while enriching your time in some of Europe’s most remarkable destinations. Two Explorer Suites feature spectacular 270 degree views with a private wraparound veranda. Veranda Suites feature two full rooms with a veranda off the living room and a French balcony in the bedroom. Enjoy the indoor-outdoor Aquavit Terrace at the bow of the ship, or relax on the Sun Deck. These “green” ships, featuring energy-efficient hybrid engines, solar panels and an organic herb garden, were named to honour prominent members of the Norse pantheon. Each ship carries 190 guests in comfortable, understated elegance, with hotel-style beds and amenities like 40-inch flat-panel TVs and in-room refrigerators. Aquavit Terrace with a revolutionary indoor/outdoor viewing area at the bow of the ship and grills for al fresco dining! While you are aboard the Viking Magni, you enjoy myriad services, from shipwide Wi-Fi service to laundry to complimentary bottled water. An onboard daily newsletter, Viking Daily, featuring information about daily activities, shore excursions and tour departure times is delivered to your stateroom every evening. For breakfast onboard Viking Magni, choose from our selections of pastries, cereals, breakfast meats, egg dishes, fresh fruit and selected cheeses. At lunch, select from the soup and sandwich bar, or a choice of entrees and dessert. And for dinner, you are treated to a five-course menu with regional specialties. You may also select from our regional wines to perfectly complement your meal. And wherever you sail, you will find enhancements reflecting your itinerary it is all part of experiencing the local culture.